Steven (Chicagoland, United States) on 18 November 2010 in Architecture and Portfolio. 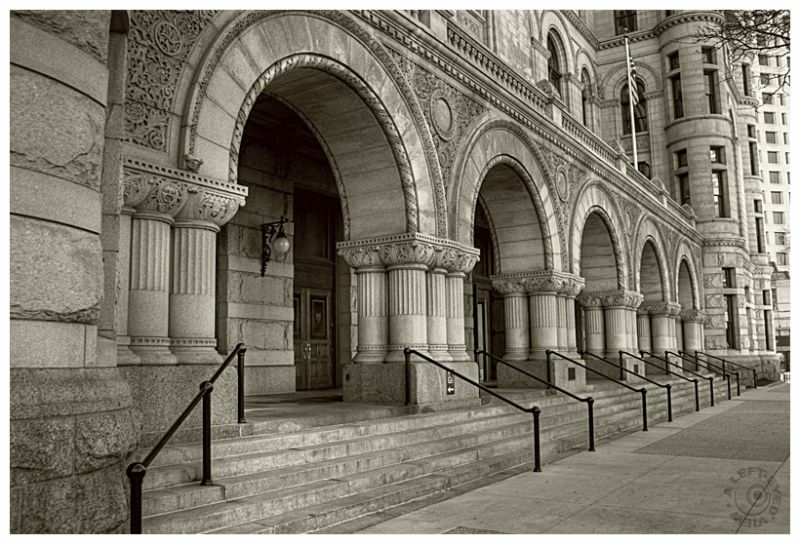 Representing one of the final stanchions of federal Romanesque architecture in the Midwest, the Milwaukee Federal Building & U.S. Courthouse, located at 517 E. Wisconsin Avenue, currently houses both a U.S. District and U.S. Bankruptcy Court and remains an exquisite example of Richardsonian Style. It was designed by Willoughby J. Edbrooke, erected in 1892-99, and designated in 1972 as a landmark of the City of Milwaukee in recognition of its architectural and historical significance to the community. Based on the Allegheny County Courthouse in Pittsburgh, it is noted for its carved ornament exterior, its spacious atrium and "Courtroom 390," which was once called "the most distinctive courtroom in the United States." Photo captured October 30, 2010. Well composed shot, you lead the eye easily from left to right. This must have looked really grand in its day. Nice capture of the classical order of things - I like the detail, the perspective, and the way flag fits in! Oh man I know this isn't Chicago, but I still expect to see Al Capone bounding down the steps (did he ever "bound"??) the quality of this image just has that feel - this is cool and asd always your description is second to none. This building has its feet firmly on the ground. No flying for it. A lovely photo. What a strong building, a beautiful architecture indeed very well captured, I like the PoV. You really bring the architecture to life. j'aime l'angle de prise de vue et l'utilisation des lignes sur ce cliché !! Great compo Steven, enhancing this lovely classical architecture. This is a very fine architectural shot . . the toning suits it perfectly, too. Love the monotone on this!